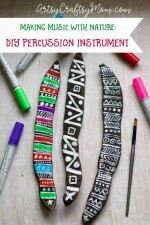 Bring the band alive at your home with these DIY Musical Instruments for Kids to Make and play! And they actually make music, too! Did you know that babies can identify music before words? That’s probably the origin for lullabies and why we tend to speak to them in a sing-song voice! Nature has an answer for everything! This love for music never really goes away, and if nurtured properly, you can raise kids to learn to appreciate good music. And how do you start that? By making some music of their own! Don’t worry, we’re not talking about expensive piano or cello lessons, unless that’s what you want, of course. Today we’re talking about making not just our own music, but our own instruments as well! Here are 20 simple DIY Musical Instruments for kids to make and play and just liven up the atmosphere! One of the first musical instruments kids play with is a drum – even if it’s just banging on an upturned bucket! This DIY hand drum from Julep is pretty and fun to carry around and just go titter tatter on either side! This tambourine from Kids Craft Room not just sounds delightful, it looks great as well! The painting is a good exercise in concentration and patience and the bells give it that lovely sound. If you’ve got an unused cardboard roll tube lying around, you have got to make this simple craft! Mum in the Madhouse makes it look so easy, beans inside the tube – but it’s really the washi tape decoration that makes this one a winner! Does jewelry count as a musical instrument? These fringe anklets from Giggles Galore sure do!! With pink felt, blingy sequins and little bells, this is every little girl’s dream! Just tie them on and dance away! We love using bits from nature to make crafts and this time we’ve used Gulmohar pods as a natural percussion instrument. It’s a lot of fun to paint on and decorate and you get a soothing, gentle sound out of it – just like Nature! Have you seen those Latin American shows or movies where people gleefully shake maracas and sway their bodies? There’s something so fun about this instrument that you can’t help but move along! Maybe that’s why babies love rattles so much! Check out the instructions for this one from Oriental Trading. Ever fancied playing a pan flute? Well, you can make one yourself now!! Cultura Creas has a lovely pan flute DIY, complete with feathers and all! Translate the page for English instructions, and let the kids experiment with straws of different materials to see how the sounds turn out. Do you remember playing with Kazoos as a kid? Well, let’s relive those memories with our own kids with a bunch of homemade kazoos – in multicolor! 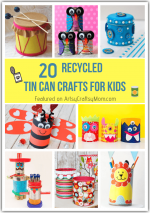 ID Kids has the tutorial to make these – all you need are toilet rolls and tissue paper and a bunch of usual craft supplies you likely already have. When you’re out for a walk on the beach next time, be sure to pick up some drift wood and shells. You’ll thank me later, as you make this lovely musical instrument from Red Ted Art! Those shells bump against each other for a lovely sound reminding you of the harmony of the ocean. This isn’t one of those guitars that look great but do nothing else – this one actually works! Use rubber bands on the shoe box and go ahead strumming away to your own tune! Check out the full video tutorial at Real Simple. Don’t throw away those strips and scraps of wood after a home project – you’ll need them for this xylophone from Borrowed Blessings! It’s amazing what some bring paint can do to trash. Use a sponge or felt covered drumstick to keep the paint on for longer. Sticks, toothpicks and rubber bands – very mundane household items that come together to create some beautiful melodies! Yes, music will happen when you make this harmonica craft from She Knows. Don’t forget to paint it in pretty colors of your choice! 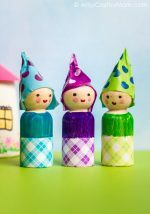 These bottle top castanets are so fun – you can carry them around in your pocket and go clickety clack whenever you please! And the fact that they look like crocodiles only makes it better! Check out Red Ted Art to find out how to make these little instruments. Ready for some larger size drums? Then check out these cute ones form Mini Eco, designed to be perfect for toddlers! If you’re making a set, try out different materials besides balloon so that you get different sounds from each. You might think it’s impossible to make a trumpet at home, but Tea Time Monkeys proves otherwise! 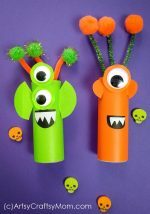 The ever versatile cardboard tube roll comes to the fore again, and combines with craft paper to create a simple trumpet that’s sure to delight the younger lot! Yes, even bobby pins can create music, if you use them right! Thrifty Fun shows us how to use these pins on a wooden board to create your very own thumb piano. If you want to avoid the staple gun, you can use some really strong tape and stick the pins in place. Punekar Sneha has a genius idea of converting coconut shells into mini tablas – a popular Indian drum. They look so cute, they’d be perfect for Diwali! Don’t forget to take out the flesh first! We’ve got drums, so what’s missing? Cymbals, of course! Check out First Palette to make these simple but clever cymbals out of paper plates. Wondering where the sound’s going to come from? Old coins glued to the inside! 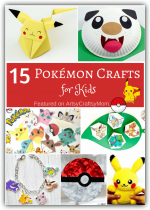 Here’s a super cute craft that’s just begging to be made! The Craft Train recycles jar lids into little banjos with craft stick handles and loom bands for strings. Decorate with washi tape and embellishments and you’re done! Yes, your child’s voice is also music, and a cool microphone will give her the confidence to let it out with vigor! 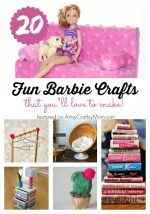 I Heart Arts and Crafts has a tutorial for a super cute and extremely easy to make microphone that can be customized to your heart’s liking. These DIY Musical Instruments for Kids aren’t just fun to make and play, they’re also a learning opportunity. Kids can learn about how ancient people made instruments with what they found in nature, and about how different cultures have different kinds of music. And yet, a good beat and a good rhythm will have anyone’s foot tapping – that’s the power of music to unite!! This is an amazing blog post. I will definitely share this post.